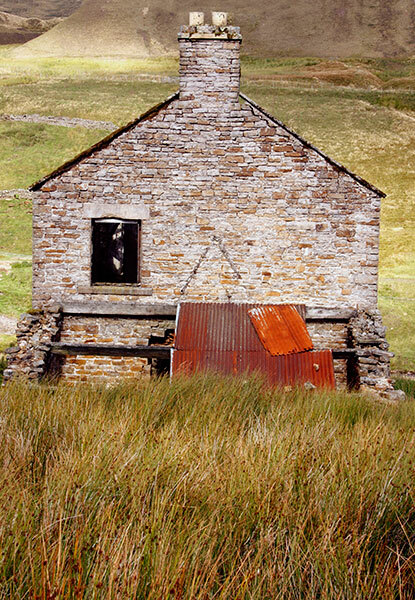 This gallery contains images of abandoned mine, farm and domestic buildings across the North Pennines Area of Outstanding Natural Beauty. Haltwhistle, Corbridge, Blanchland, Stanhope and Alston are the principal settlements on the periphery of the walks area. 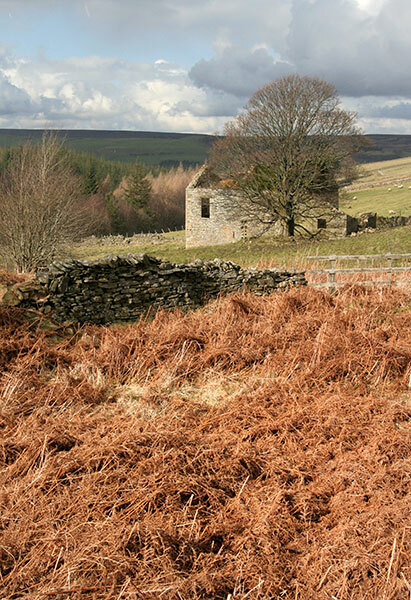 South Tynedale, East and West Allendale and Weardale contain the significant rivers that have for long shaped the landscape and influenced human habitation and activity. Exploitation of the areas’ mineral resources has a long history from Roman times. I hope to explore this theme more extensively in 2015 alongside a study of abandoned railway constructions associated with mining and quarrying rather than the carriage of passengers. 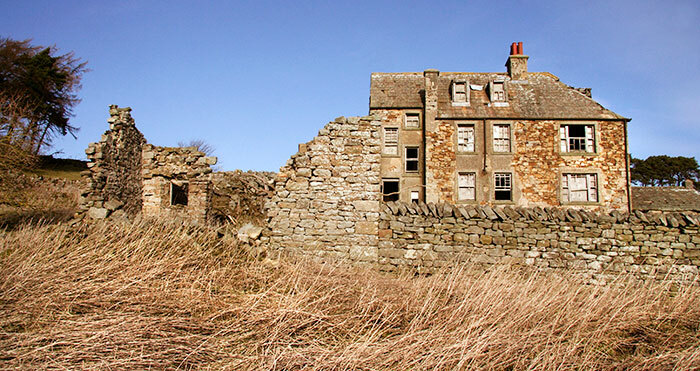 This house is on the fringes of a scatter of ruinous buildings that once served deep mines in a valley cut by a narrow burn lying hidden beyond. Extensive overlapping heaps of spoil form a backdrop on the hillsides to the north. Much of the slate-clad roof and its timbers have gone leaving remnants to cast interior shadows created by the midday sun. Timber beams and flooring have gone for recycling or fuel leaving the chimney breast for two fireplaces exposed. Plaster is dropping away from the masonry walls. There is no trace of any wallpaper that might once have been the background to furniture and furnishings. Its dimensions suggests that it might have been home to a senior mine employee. 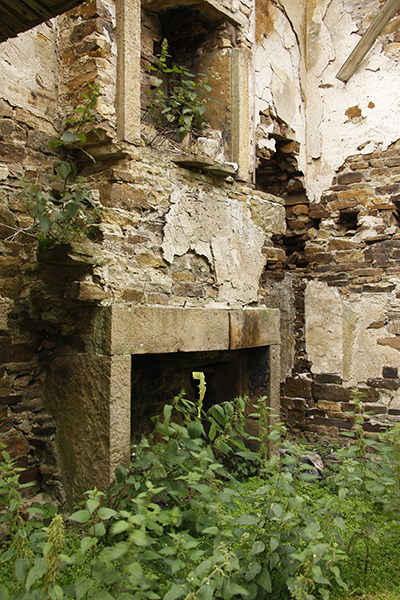 The remains of a cast iron cooking and water heating range are still framed by stone slabs and a breaking lintel. 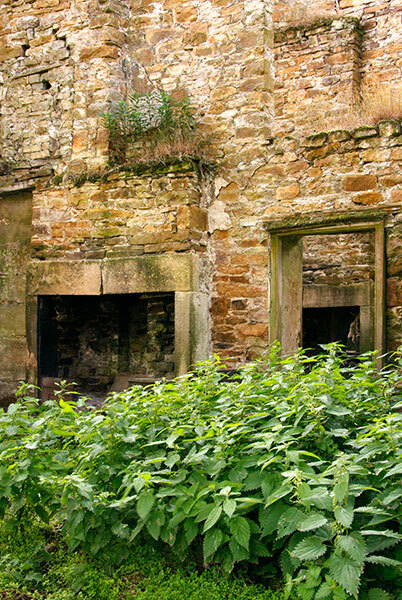 Stinging nettles grew vigorously around the house but these specimens had the advantage of walls to shelter them from the winds and rough weather on the exposed hillside. Across the mine site and much closer to the water level in the burn this three-bay terrace structure stands two-thirds roofless and in precarious decay. It could have been a working building or domestic quarters. Apart from the large house in the previous images this might be the only surviving domestic building at the mine: others could have been demolished and removed. 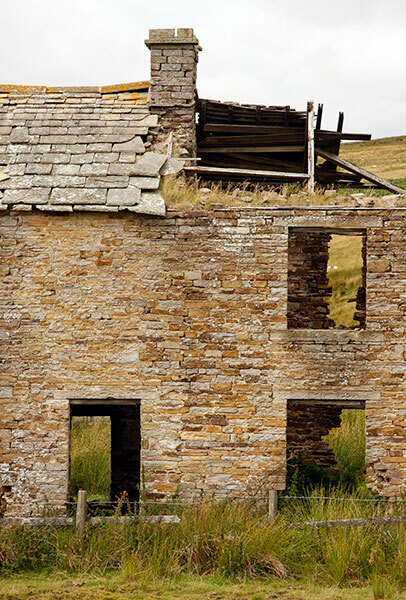 Workers would also have lived in the more isolated houses nearby or in neighbouring settlements. The weight of stone bearing down on this slender and poorly supported lintel suggests an imminent collapse of the middle space in the terrace. The masonry recesses once housed substantial timber beams to carry the first floor planking. Rushes in the boggy ground crowd the doorway. 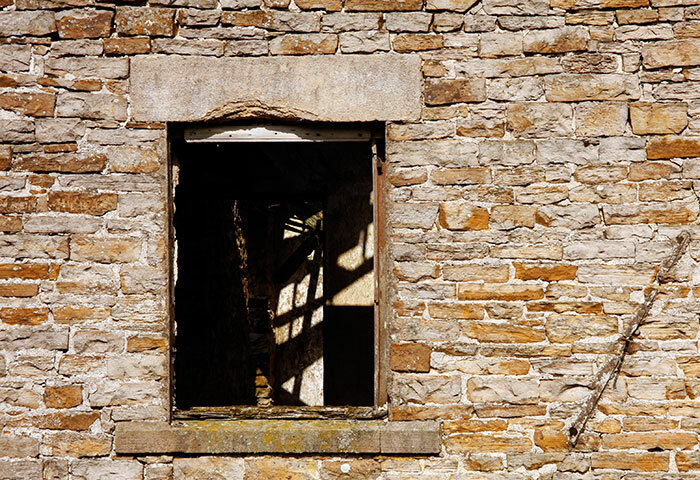 A sandstone roofing slab pierced by a single hole for its fixing peg leans against the wall. I was standing at the junction of a paved road and a rough track leading down to a burn running through the valley to the left. I liked the tumultuous rust-hued bracken fronting the layers of wall, landscape and sky rising up the image. The landscape behind me has the scant remnants of a long ribbon of mining structures and waste heaps set on both banks of the stream. I walked the curved and descending track to this point close to a fenced-off adit, an arched stone-lined horizontal mine tunnel dug into the hillside below the house. Drift mining exploits the exposure of horizontal strata bearing ore and coal beds on sloping terrain. They and vertically bored shafts are prolific in this area of the North Pennines. The house is on private pasture land so I did not get close enough to determine its past use for mining or farming; it does not seem particularly domestic. The burn runs eastwards from its source in the high hills towards Allendale. 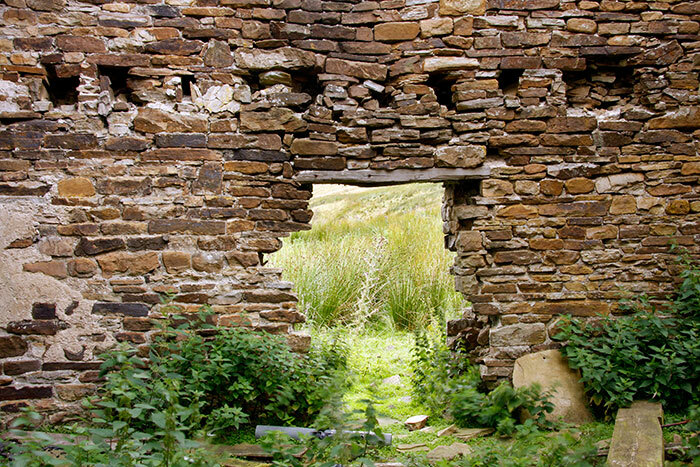 It was once part of extensive lead mining and smelting works slotted into the narrow valley floor. It’s still used as a footpath and as access to farm small holdings on the rising ground to the left. The steep slopes of the wild landscape to the right still carry the remains of masonry ground flues that carried away the poisonous lead smelter fumes to tall ridge-top chimneys. 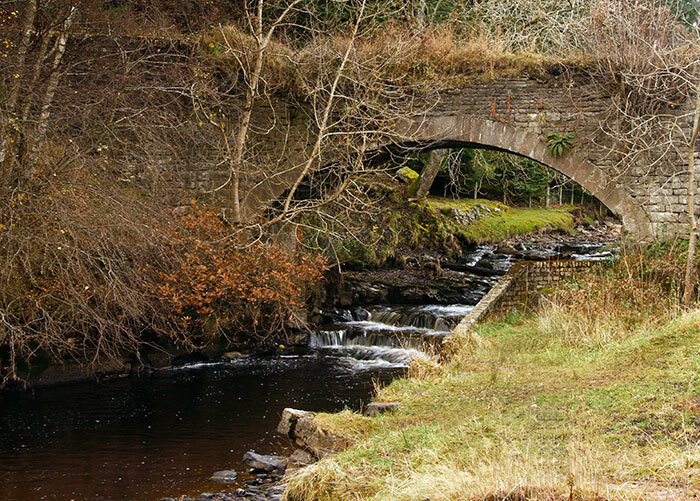 Just below the stone bridge the stream enters masonry-lined banks through the works. Here, exposed steel girders and tramway rails have lost their deck timbers. The steep slope beyond carries some fine beech trees whose red autumn leaves had a strong influence on light and the physical colours of the micro landscape. A retired former worker said that in its earlier working days the works were linked by tramway to a standard gauge railway at the valley mouth. 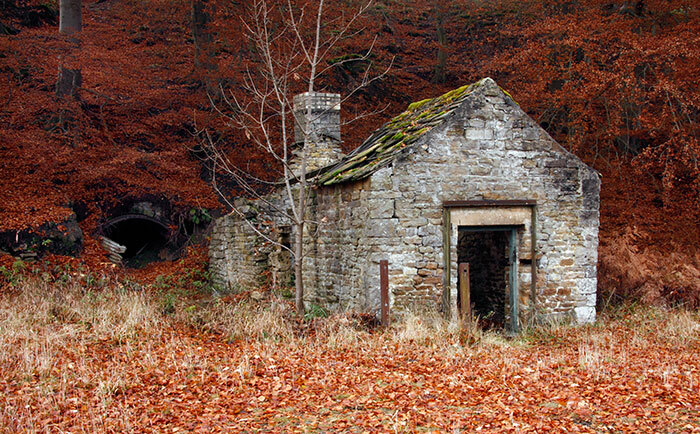 The shadowy and collapsing entrance to a drift mine is set into the slope left of this small stone building. A spur from the remnants of a narrow gauge tramway system is still in place in the latter and perhaps inside the mine tunnel itself. It looks as though it may have been a small workshop, now with most of its stone slab and timber roof missing. The extensive scale of the site suggests a once busy enterprise. I think that it was last used to mine fluorite in the 1990s, a long working life since opening for lead extraction in the mid-nineteenth century. A little further downstream this overgrown and flooded area looks as though it was once a dry working floor for some aspect of mining activity. I’d like to have seen the whole active complex, even in its reduced final years, but my interest in photography and Pennine lead mining had yet to develop. Like any landscape, its constant changes in physical appearance and lighting fascinate. These autumn colours seem particularly appropriate but perhaps I’ll return late one spring when the vegetation is fresh and green. A network of roads, tracks and footpaths offers a great walking choice within the boundaries noted in the first caption. 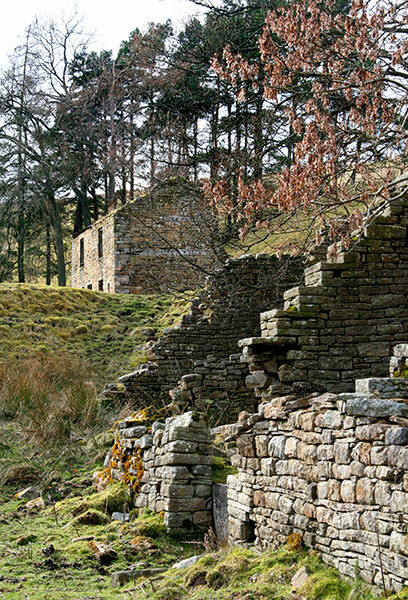 This isolated house and its outbuildings are set high in the hills. There’s little to disturb the silence other than wind through grass and trees, its sound accented by sheep and bird calls. The rending sound of a low flying military aircraft very occasionally and briefly intrudes. 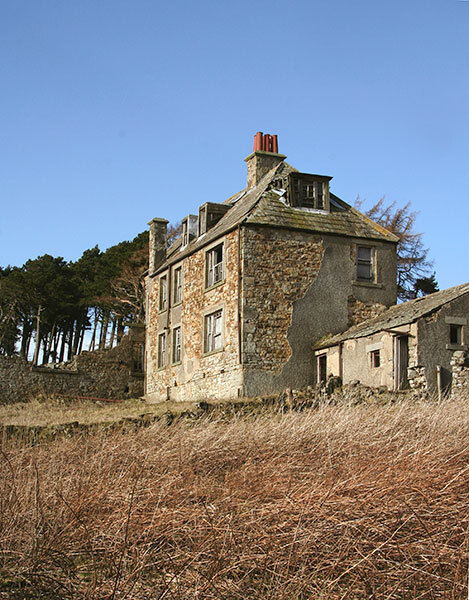 The main house was built as a rural retreat but now stands abandoned and in decay. 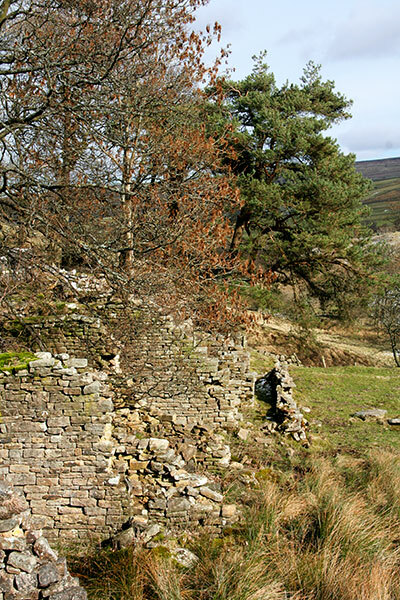 Set on a south facing slope it commands wide views across a long steep sided valley to the Weardale hills beyond. A long, narrow, conifer woodland provides some shelter from the prevailing westerly and north winds but in rough weather the house and garden are still very exposed. The walled garden is green with luxuriant stinging nettles in summer but much more approachable after they dry to brown in late autumn. A track survives from the days the house was accessed by vehicles but now little used for other than work associated with sheep farming and forestry. I liked the casual still-life of decaying tree trunks set in an angle between outbuildings framing a fragment of the main house and its coxcomb of terracotta chimney pots. 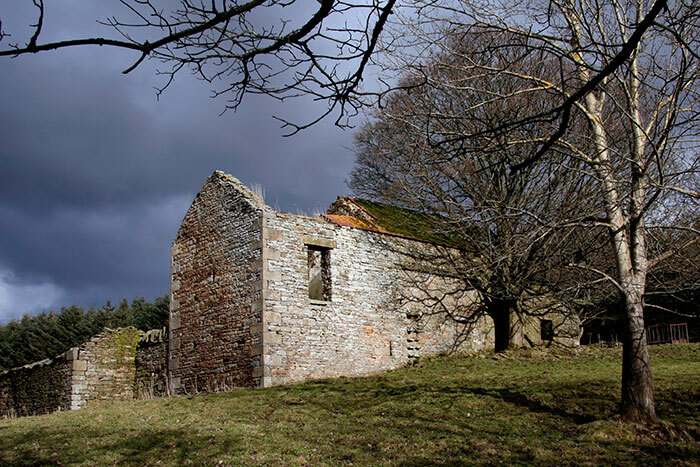 Several buildings formed a steading for horses, livestock and vehicles. Nearby, a long freestanding barn stands in good repair under a rich red-rusted corrugated iron roof. 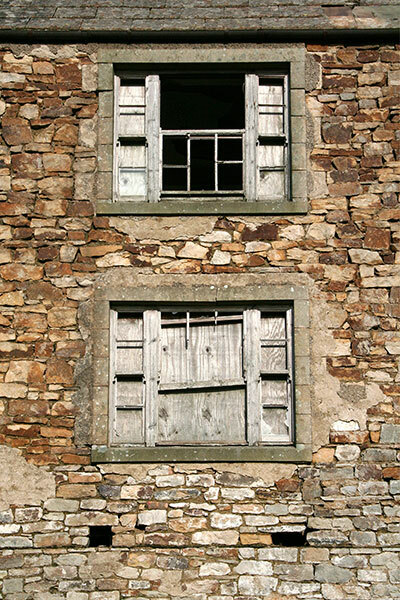 Timber joinery has been exposed to Pennine weather for more than a century. Paint and putty have fallen away, dropping the glass panes to shatter on the ground below. Some sash cords have decayed to release window sashes but some have survived tightly closed. 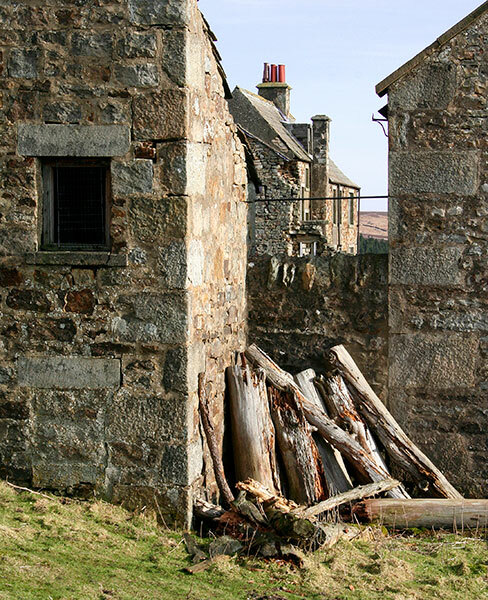 The slated roof is in reasonable repair but sliding slates will gradually admit more wind and weather to the abandoned interiors. 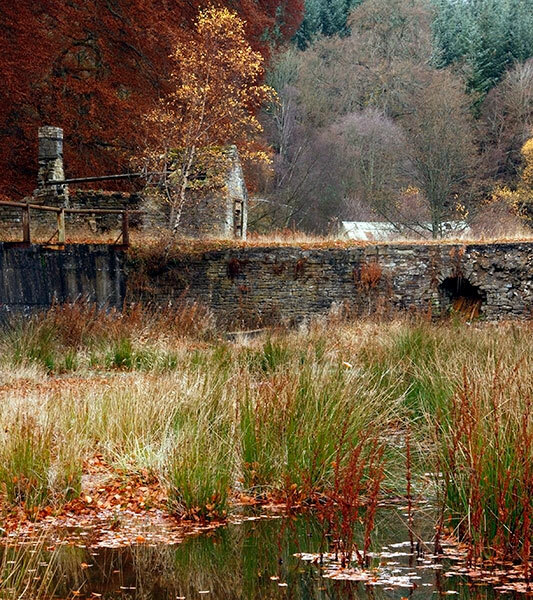 In its heyday it would have been an interesting place from which to explore the surrounding landscapes. 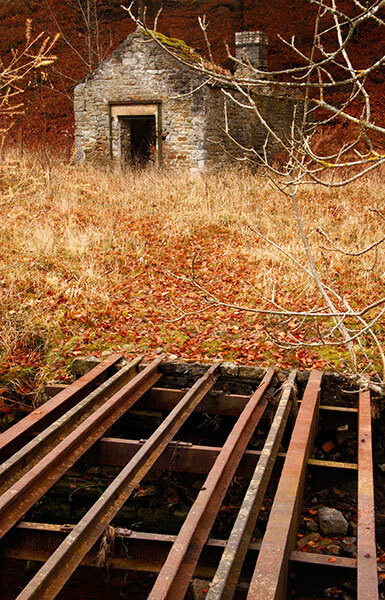 These are the only built remains of a small lead mine active in the middle decades of the nineteenth century. The building on the higher ground stands next to the horizontal tunnel providing access to the mine. The foreground masonry formed bouse teams used to store the material brought out of the mines. Each small group of miners would use their space to sort their ore for smelting: the rubble was added to the nearby spoil heap. The quality and weight of the former would presumably govern their variable earnings. The structures are listed buildings and protected from anything other than conservation. The unpaved track along which the ore would have been removed to remote smelters by packhorse is off the image to the right. My walk to and from the site hinted at the full time activity of the animals and their minders, pleasant on a crisp autumn day but less so in January snow and a biting wind. Incidentally, the photograph suggests something of the isolation of the mine set above a stream in a remote Allendale landscape.